This idyllic four-bedroom cottage can accommodate up to twelve guests, thereby making it an ideal stay for a group getaway. 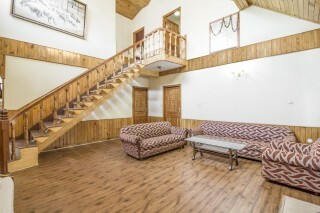 The property is conveniently located close to major places of attraction including Jogini Waterfall (1.2 km), Mall Road (2.5 km), Hadimba Devi Temple (4.8 km), and Museum of Himachal Culture and Folk Art (5 km). With lush green hills in the background, this archetypal property houses a well-tended garden dotted with flowering plants and easy chairs, which makes for an ideal place to indulge in pleasant conversations with your travel companions. 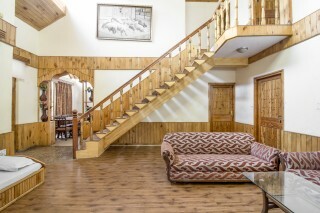 The living room has wood-panelled walls and wooden flooring, which is a characteristic feature of the mountain abodes. The room has plush sofas, a television for entertainment, and a fireplace that adds an element of warmth to the space. An eight-seat dinette is also provided so that you can comfortably enjoy your meals. The bedrooms are well-furnished to provide necessary comfort. Additionally, a television is also provided so that you can stay updated with the latest happenings. The bathrooms are well tiled and equipped with western sanitary ware. Guests are requested to provide valid ID proof at the time of check-in. Rs 1000/day for the chef. 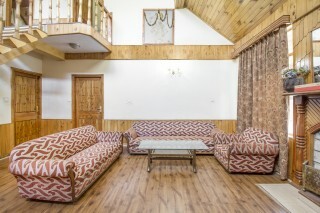 Rs 1500 for the gas( one time day for the entire stay) Coffee/tea maker in each room. 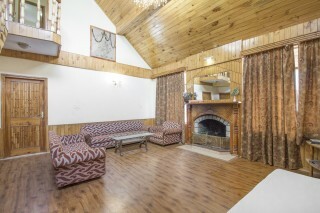 It is a beautifully designed cottage which has extensive wood work and lies close to the river Beas. 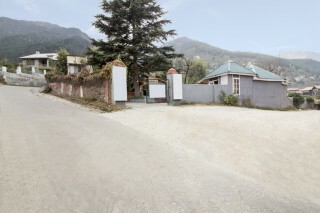 Places like Mall Road and Salong Valley are nearby. Apart from the fact that there’s freshly made food available, there is a kitchen area as well, for people who love culinary experiments. There is a caretaker available on request. 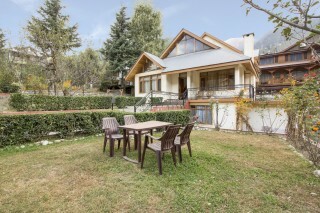 This cottage is best suited for a romantic getaway. Hi...cottage was pretty good...place and the location was perfect..but the kitchen provided to us we can not use it. it had just 2 to 3 glasses ..gas also was not connected..so services could be little better. 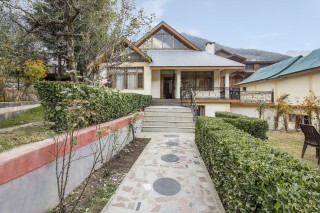 In a paradise like Manali, this property was a cherry on the cake. Alluring Cottage having Library and Indoor Fireplace.